Rydoo’s travel and expense management system brings a new level of innovation, efficiency and transparency to the banking sector. Forget filling out expense reports - save time and the environment with our paperless system. It’s easy to implement your banks existing spending rules and Rydoo will notify you when duplicate receipts are detected or when expense thresholds are exceeded. We save banking companies up to 75% of time spent on laborious administrative tasks, meaning your employees have more time to work on what really matters. 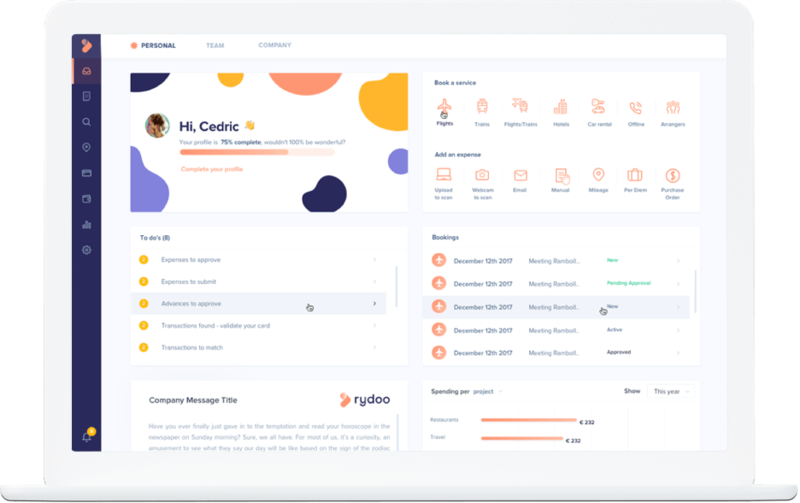 You can customise Rydoo to reflect existing hierarchies and approval chains, and automate Per Diems or regular expenses. We centralise all your expenses into one system, making it that much easier to keep track and discover actionable insights on manage spending. To find out more about how Rydoo can save your bank time and money simply get in touch. Rydoo adapts to your company’s structure, not the other way around. Arrange teams and business units in a way that naturally reflects your existing hierarchy of approval flow. No matter the size, purpose or structure of your organisation, the settings can be customised to suit your team. Ensure a seamless data flow between Rydoo and your companies currently running software solutions. Whether you want to integrate card transactions, your Active Directory or your financial software, Rydoo offers multiple out of the box solutions to get you started in no time. For us, it is very important to constantly innovate our processes and tools, to reduce administration and to increase efficiency. Thanks to Rydoo we know faster how much we spent on a certain project or client. Find out more.